There are very few vegetables I've met that I haven't liked. Last night, for example, I roasted 2.5 lbs of asparagus and there wasn't enough left for D's lunch. The kids pretty much inhaled it. Brussels Sprouts? My mom never made them and when I tried them for the first time as an adult, I had to wonder what all the hate was about. And peas...for a long time I grew up thinking I hated peas. When I tried them fresh for the first time, it was love at first bite. Next, I tried fresh cooked and came to the shocking realization that I didn't hate peas...I just hated canned peas. The first time I made collard greens, it was a complete disaster. As a family, we sat around the table looking at the boiled pile of green in the middle of the table. None of us wanted to take the first bite. I made everyone take a fork full and then I counted to five so we could take the first bite together. We did it and ...we all promptly spit it out in unison. It was disgusting. Vile. Absolutely awful tasting as it smelled. No one told me I needed to rinse the greens in salt water before cooking. It's been 10 years and I've never made them again. I will eat them when we go out and they are a staple on the school lunch menu, but make them myself? No. Just no. Out of all of this, I've taught my kids they aren't allowed to say they don't like a food. They are, however, allowed to say they don't like the way a food is prepared. The difference is subtle, but it gives them the possibility that maybe one day, they may discover a food they once didn't like is suddenly good. That's what happened to me with sweet potatoes. One Thanksgiving my Sister-in-Law, Linda, made this sweet potato casserole that really shouldn't even be classified as a casserole. It was so laden with butter and sugars that it was a dessert, but it contained a vegetable so it went out on the side dish table. It opened the gateway for my sweet potato love (Sonic now has sweet potato tots!!!) but I still will not ever touch sweet potatoes with marshmallows. But, there is one vegetable that no matter how it is prepared that I will not, cannot even stomach in a cooked form unless it is completely hidden: Carrots. I wish I could hide behind The Boy's stance that cooked vegetables have a weird texture that makes them completely inedible. I can't because it's only cooked carrots for which I have a deep loathing. The only food even more vile? Liver and onions. Yeah...that's how much I HATE cooked carrots. The other Iron Chef Moms will attest that I put up a fight against carrots as the secret ingredient. I was gagging through recipe books trying to find something...anything... to make the carrot the shining star. But when a vegetable is so gross when its cooked as carrots, there's really not much you can do to help. And so, I took the easy way out and adapted a recipe that hides vegetables in foods...and so I bring to you... 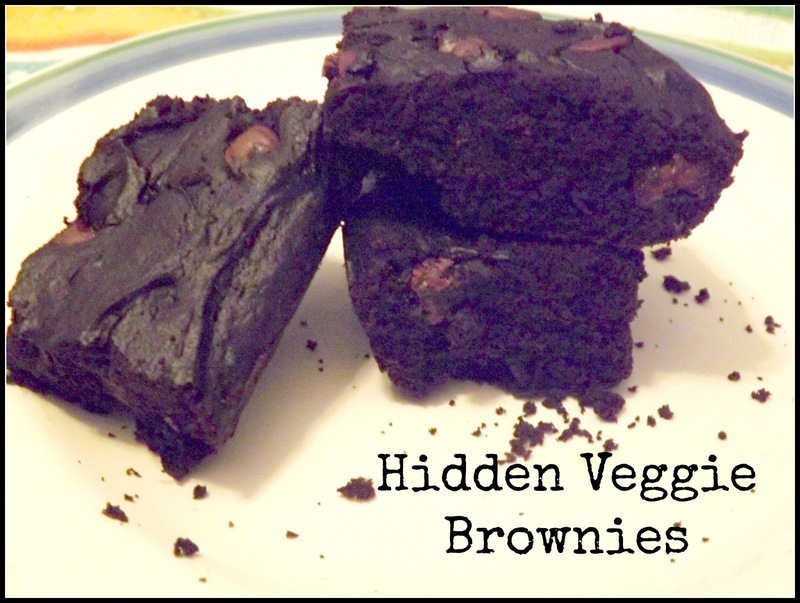 These aren't very sweet, so if you'd like a sweeter brownie, add in an additional 1/2 C brown sugar. 1. Preheat the oven to 350 degrees F. Coat an 8x8 inch baking pan with cooking spray. 2 . In a large bowl, combine cocoa powder, vegetable oil, baby food, sugar, margarine, and vanilla, and whisk until smooth an creamy, 1-2 minutes. 5. Pour the batter into the pan and bake 35-40 minutes. Cool completely in the pan before cutting into 12 bars. Don't forget to come back HERE next week for battle...PEEPS! If you can't stand Peeps (something I just can't understand LOL) you can use marshmallows! We must be taste sisters. I hate cooked carrots. HATE. I use them shredded in spaghetti sauce and in soups. They actually make the taste really nice, but I simply cannot put a cooked carrot in my mouth. I can do savory sweet potatoes but I'm with you on the marshmallow and sweet crap. I'd rather starve. I never thought of chocolate as a way to disguise carrots. I might have to give this a try. Our link party is going on all day today and tomorrow until midnight. Hope you'll stop by! I love your page.